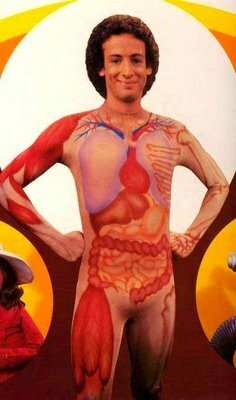 Jared Unzipped: Remember Slim Goodbody? And you thought you'd pushed this memory out of your mind, didn't you? In the decade of excess, a thin man hopping around television in an anatomically correct leotard oddly didn't seem so strange. And yet, I wanted to plant this image back in your head. Yeah... take a closer look. Ah, Mr. Slim Goodbody. In all actuality, this oddball had a perfectly good reason for prancing around looking like he'd been in a horrible accident with a giant vacuum. He was portrayed by John Burstein, whom created the persona in the mid 1970's to entertain sick hospital children. Along with the flashy costume, he sung songs and performed skits pertaining to the human anatomy and health. In the 1980's, Burstein expanded upon the character and brought the Goodbody act to television on PBS. And that's where all your foggy, semi-frightening memories came from. THE INSIDE-OUT MAN FROM YOUR PAST HAS RETURNED! Goodbody appearing with television legend and mainstay of my local PBS affiliate as a child, Captain Kangaroo. 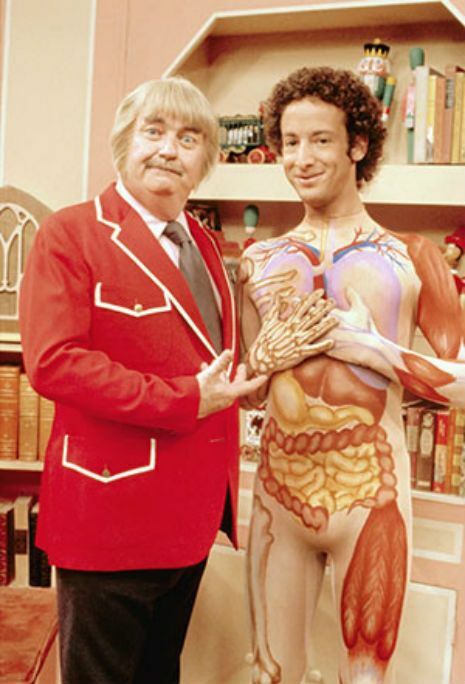 Burstein still performs as Slim Goodbody occasionally while touring the USA, mainly playing to school crowds. I'll give the guy credit -- he spoke about the dangers of childhood obesity long before any of the other adults in my life did. 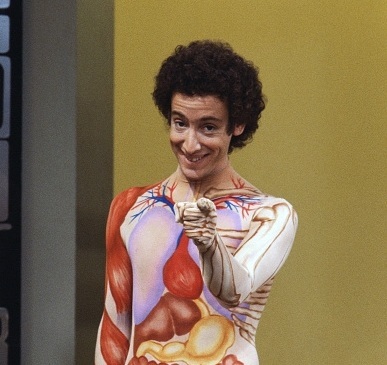 I salute you Mr. Goodbody! And now, for your viewing pleasure, an old episode from the 1980's Slim Goodbody television show! This one's about how you go poop!